Question: I am installing a new 150Amp overhead service to an older home. There are 3 wires going into the house with the main being in the panel. When I put the new meterbase in it will have a 150 Amp main and 4 spaces for breakers, I will feed the existing panel from a 100 Amp breaker out of the new box. My questions are, 1. How many conductors will the power company run to the meter socket? 2. The existing panel has a main and is fed with 3 conductors, however, the new meter socket will contain a main so how and where should I bond/ground the ungrounded conductor? I have to install 2 ground rods at the new service so the meter socket will be grounded but I am not sure how to accommodate the existing panel/main. Thank you. i don't think this is not a job you should be taking on your own. There is a lot of knowledge necessary to do this installation correctly and safely. Please look at my how to blog below and search for "sub-panel". I know that you can find some pictures and videos that could help you. I will answer two questions below but if you are asking those two question then I'm sure there are 100 more you don't even know to ask. Please hire a pro for this job or have your work inspected. 1. The utility will bring you 2 hot wires out of phase with 120volts on each leg to ground and 240 volts across the pair. They will also bring you a grounded conductor. that is a total of three wire in a single phase service. 2. After you electricity passes the main breaker the grounded conductor needs to be split into a ground conductor and a neutral wire. 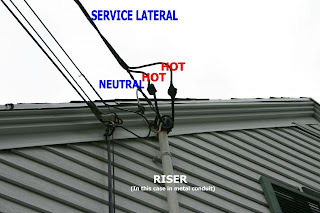 All metal part associated with the service need to be bonded to the ground wire. The entire system needs to be grounder to a ground rod with an ohm reading of less then 25 ohms and to the water main.